After a two-year stint as a rookie teacher at a small and new Catholic high school in northern New Jersey, I left the job for economic and personal reasons. The economics reflected starting a family (my wife ceased to work as a new mother). The personal involved doubts about my chosen profession. Because of a confluence of circumstances, I had been made English Department Chairman. I was given this position simply because I was the first of the new English teachers hired to staff the school, where I taught junior and senior English. Fresh out of college, I felt out of my depth as an educator. I had to design a curriculum, assign classes, and select and order textbooks, all without a veteran teacher or mentor as a sounding board. Lacking any frame of reference, I felt relieved when economic issues forced me to resign. After two subsequent years as the world’s worst salesman (tires), I realized that although I was raw and uneven in my teaching, my future lay in education. What I needed, I determined, was further experience in the company of other teachers who could provide answers to questions that mattered in the day-to-day life of an educator. The opportunity to reenter teaching presented itself in 1972 when an opening occurred at West Side Central Catholic (soon to be renamed Bishop O’Reilly) High School in Kingston, Pennsylvania. I took the position full of doubts and reservations, but determined to learn, once and for all, if time and circumstance could make a difference. It was to be a turning point in my life, both professionally and personally. My first impression of the students was impressive. They seemed to move through the day with an ease and maturity untypical for teenagers. While they certainly dealt with the universal and eternal concerns of peer acceptance, self-image and increasing autonomy, they nevertheless demonstrated a congenial symbiosis with teachers and administrators, and exhibited a genuine sense of belonging to their school. In general, they looked comfortable and content in their demeanor. There were cliques, for sure, but no real distinct separation. Jocks were in the glee club and in plays, while National Honor Society students played sports and joined homecoming committees. With rare exceptions, they respected their teachers, and looked upon them as professionals who cared about their academic and personal development. During the second half of my first year at Central Catholic, I experienced the quality of music and quantity of student involvement in the Glee Club. On the Friday before the annual spring concert, participating students were excused from classes for an all-day rehearsal. Most junior and senior teachers did not conduct classes, as more than half of our students were in the auditorium fine-tuning their performance. On my way the faculty lounge on my prep period, I stopped in the hallway as a student exited the closed double doors leading to the auditorium/gym. To this day I can hear the mellifluous four-part harmony of Cat Stevens’ Morning Has Broken flowing from the assembled choir. I was then, and continue to be, struck by the quality of the presentation. It sounded as if it were a professional rendition, quite unlike a usual performance of a high school choir. I stood there as the song ended, and a spontaneous outpouring of oohs and aahs came from the students who had surprised themselves with their impressive efforts. I remember thinking how fortunate I was to be part of a school that could offer such activities and produce such results. I always considered them as guests in my classroom. As their host, I both extended and received a respect that permeated our discussions and interactions. Even their gentle mockery of the faculty belied a palpable esteem. I remember student-generated and circulated comic books that poked fun at teachers who, they alleged, were hiding in plain sight as superheroes. One history teacher in particular was presented as “Captain Coma,” who wore a cape with a huge C in its center. Captain Coma once saved children from escaping tigers and lions at a zoo by lecturing them until they fell into comas in mid rampage. Our obese priest administer, however, was drawn as a blimp floating over the school, with the words “B.F. Grimalia” written on its sides. That same comic book creator also performed a variety of stunts, one of which, in today’s jittery social environment, could easily have resulted in the summoning of a SWAT team. 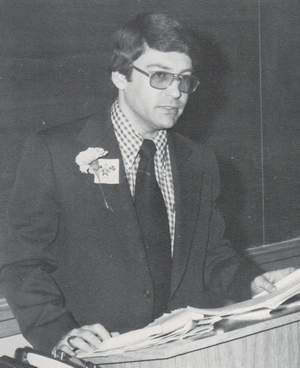 In addition to mounting a cafeteria table during lunch and pulling a rubber chicken from inside his jacket, wearing a Steve Martin arrow-through–the-skull headband, and threatening to “pie” Sister Gratiana during Class Night (a 1970’s fad made popular by the television show, “Laugh In”), he once suddenly called out my name midway through class, and pointed what looked like a very real black 45 caliber handgun at me. After my life passed briefly before my eyes, I regained my composure as a stream of water arched from the toy gun. I confiscated the water pistol and continued class without further interruption. When students in other classes asked about the incident, I dismissed it as the joke it was surely meant to be, indicating that it was just ol’ Bob practicing his weird brand of humor. For a split second, though, I almost had a laundry problem. The fact that that event caused nary a ripple of official concern reflects the relative innocence of the era in which it occurred. We had our share of miscreants over the years, but they usually didn’t last long in the school’s family ambience. They were looked upon as odd or pitiful by the majority of students, alongside of whom they stood out in marked contrast. While my rose-colored glasses of retirement have not obscured the undercurrent of experimentation that colors teenagers of all eras, the reality is that such activity rarely breached the surface of student life in any blatant or consistent fashion. Perhaps strong family bonds were part of that equation. At any rate, a positive student demeanor and deportment evidenced itself in an excellent academic and social environment. Perhaps the best example of the school’s warmth and vitality can be seen in its addition of an educational program for special-needs students during its later years. Essentially a school within a school, its curriculum was geared to the needs of these students, although there was some overlap in other courses, such as computer classes. These students also shared lunch in the cafeteria, attended pep rallies and frequented sporting events. If the idea was to have such students get used to mainstream society, it accomplished considerably more. As I stood at my classroom door during change of classes, I often witnessed my students making casual conversation with these special adolescents, high-fiving them and asking about their classes. In the final analysis, I don’t know which group learned more about life and love in those interactions. The teachers were of two types: generally older nuns from several orders (their percentage of the faculty had begun to decline markedly as vocations ebbed after Vatican II), and generally younger lay teachers. Initially, the sisters seemed to tolerate us as unfortunately necessary components of the teaching staff. Over the years I spent at the school, the ratio of sisters to lay teachers tilted quickly. By the end of the school’s existence, one nun was on staff as a librarian. Lay teachers were generally in their twenties in the early 70’s, mostly graduates of local colleges and residents of surrounding communities. Because Catholic schools were exempt from state/federal educational policies and regulations, and the religious staff generally left us to our own resources, we were able to pursue teaching in a purely practical and innovative fashion. We weren’t bogged down in a morass of state standards, regulations and testing, promulgated by faceless bureaucratic “experts” who couldn’t find the inside of a classroom with a map and a flashlight. Consequently, we relied upon one another to build and implement teaching methods and strategy. Aside from periodic (and generally inconsequential) teacher meetings conducted by the administration, we discussed our mutual concerns informally – in the faculty lounge and local taverns, at holiday “progressive parties,” and end-of-the-year picnic outings. Because we shared our approaches and discussed our failures and successes, we grew and prospered as a faculty. The result created an exceptional educational experience for teachers and students alike. During the four decades I spent at Central Catholic/Bishop O’Reilly, graduating seniors merited college acceptance in the 90th percentile range and millions of dollars in scholarship offers. At the risk of sounding hyperbolic, I found teaching at Central/O’Reilly to be almost magical. The work was both hard and time-consuming, but the classroom experience made those considerations more than worthwhile. Very often the change-of-class bell interrupted a class discussion that neither students nor teacher wanted to end. Because many teachers volunteered their time to chaperone after-school activities, we got to know students, and to be known by them, in an added dimension. Teachers in charge of a student club or activity had merely to ask their colleagues to assist at an event. Proms, all-night dance marathons, plays and concerts all provided teacher-student interaction outside the classroom. Weekly free tutoring at the school in multi-disciplinary areas during early evening hours also offered opportunities to foster mutual understanding and respect. One event involving extra-curricular teacher-student involvement occurred during a mid-70’s all-night (24 hour) dance marathon for a charity I cannot recall. In that era, no thought was given to any chaperones besides the faculty members who volunteered shifts. We initially had neither a medical nor security presence at the events. At the particular marathon I recall, the doors on both sides of the gym were open to provide a breeze to offset the humid middle of the night. The loud music over the sound system must have filtered onto the streets surrounding the school, and resulted in some unwanted visitors. Four males in their mid to late 20’s drove to the parking lot and entered the gym through the its open doors in the early A.M. hours. To say they looked dangerous is not an exaggeration. They sauntered across the gym floors, weaving their way through the young and vulnerable dancing students, and sat in the middle of the first row of the gym seats. I watched as they chuckled, nudged each other and they pointed out female students to one another. In an era without cell phones, I was about to go to the main office to telephone the Kingston Police (I didn’t have any idea of what I would tell them, since no crime had been committed), when one of my students, Jimmy Reino, walked by with a box of pizza. Noticing my concerned appearance, he stopped and asked what was the matter. When I pointed my chin in the direction of the four possible miscreants, he asked me to hold the pizza. He casually walked to the four, sat beside them and began a low conversation. After four or five minutes, they got up and promptly left the dance without looking back. When Jimmy came back and retrieved the pizza, I asked him what he had said to the departing foursome. He replied in an off-handedly conversational tone, “You don’t want to know,” as he took the pizza to some hungry students. After that marathon, we made it a point to have the school nurse (or a parent who was a nurse), and an off-duty Kingston police officer as evening and A.M. chaperones as well. A generation later, I had the pleasure of teaching Jimmy’s lovely daughter. In retrospect, the number of second-generation students whose parents I had taught offers confirmation of the value afforded the school. At report card nights, parents often related their desire to have their children share their high school experience. It is noteworthy that we also taught many students whose parents were public school teachers and administrators. Perhaps the most telling and gratifying indication that we were doing worthwhile work can be seen in the number of graduates who returned to the school as new educators and became valued colleagues of their former teachers. The time and distance afforded by retirement has deepened my appreciation for being able to participate in such an extraordinary time and place. It is a source of immense satisfaction that the school’s traditions and accomplishments endure in the memories of her graduates and will be passed on to their children and grandchildren. I suppose that line from the Alma Mater had it right: West Side Central Catholic/Bishop O’Reilly will “live on in glory” in the hearts and minds of everyone lucky enough to be associated with that incredibly fulfilling educational institution. Not only is that time a “golden age” in memory, it carried with it a golden aura each day I walked those halls, and for that I will always be grateful. I had Mr. Lynch twice for English when I was at O’Reilly and not only do I still remember the content of the books he had us read, but I remember really enjoying reading them and the lesson. He definitely made class enjoyable and exciting – just like he did for my mom and my uncle many years before! Great article, great teacher! Mr. James Lynch was in fact one of my favorite and more memorable educators at Central Catholic/Bishop O’Reilly High School. He taught, he humanized the material we learned and most importantly, he made it a point to get to know each and every one of us as he did so, elevating our self-esteem concurrently. This is when the adolescent brain, while wired to believe it’s an adult, is truly not. It requires further nurturing and guidance even into and through its early 20’s at least. While he could not travel with us that far, he sent us happily on our respective ways with his tremendous expertise (a true avocation) and immense feeling for each of us. In his writing above, one thing particularly struck me as true, at least for my graduating class of 1974. While the 250+ of us obviously had different goals and interests during our high school years and for the future, we were a rather tight knit class who all personally knew each other on one level or another. As he put it, yes, there were cliques, but jocks were also members of the chorus, AP students were in all aspects of the annual School Play from lead characters to music to building sets to lighting, students in general volunteered their time for Dance Marathons, cheering sections in games, and on and on. We came from towns like Kingston itself and some as far as Harvey’s Lake. It didn’t matter. We were a unit. Many years after I graduated and was long gone, my brother, having retired, actually taught Chemistry at Bishop O’Reilly with Mr. Lynch and came to know him well. He holds him in the same high regard as I do. Sadly, the Parochial Schools are being closed one by one and the buildings sold off. Even ones that were profitable and had many local people try to petition the Bishop on behalf of what these schools had and still have to offer, had the words fall on deaf ears. I am thankful to have been there for those “golden years” at Central Catholic High School with teachers such as James Lynch to guide and shape my mind. Mr. Lynch, after forty-nine years on this planet, is the 3rd most influential person I have ever had the honor to meet! Hands down!